Judith Klausner work revels in the minutia of the world. She has recently taken a great artistic and personal risk with her new series Coming Out of the Medicine Cabinet. 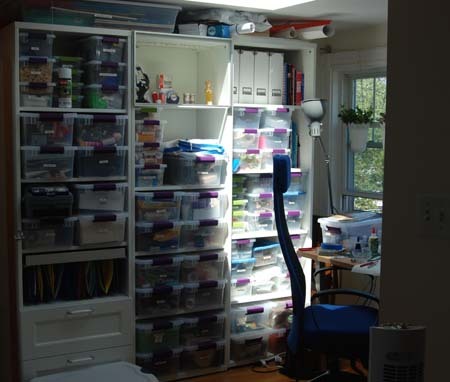 Here she graciously offers us a peek into her studio. 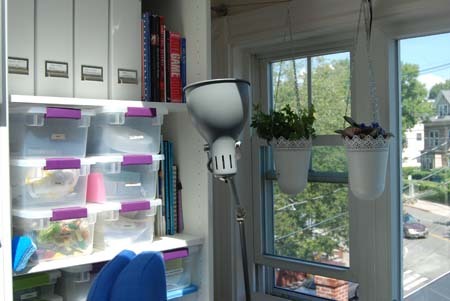 I have not naturally been an organized person with my space, but over the last year I’ve really been trying to turn that around. After nearly 3 years of my “studio” mostly consisting of taking over the dining room table, I finally did an overhaul of the space intended to be my studio since I moved into this apartment 3 years ago. 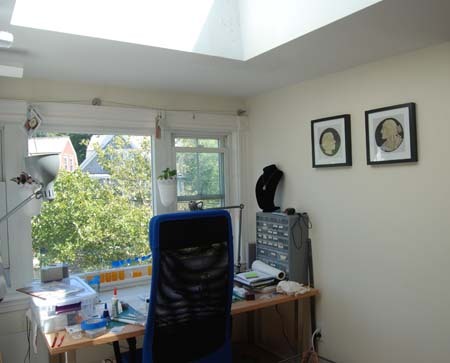 It’s a small but beautiful nook full of natural light; I’m very lucky to have two skylights and a big window overlooking the neighborhood. The windows help particularly on days when I’m working nonstop and never make it out of the house; I don’t feel like I’ve missed it quite as much when I can see the sky and feel the breeze. 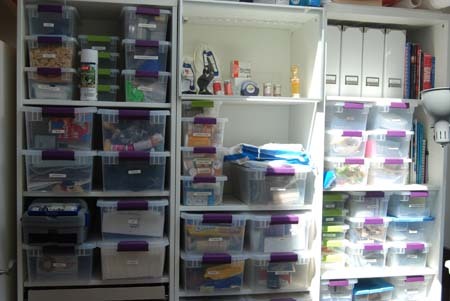 I took a page from my partner’s book (and borrowed his label-maker), and sorted all of my supplies into labeled plastic bins (visitors are often amused by the sometimes bizarre labels my odd materials have produced). A customizable Ikea shelving unit provided the perfect storage framework while not taking up too much of my limited footprint, and I was even able to include a little display case. The case has been especially helpful with the new series I’ve been working on, Coming Out of the Medicine Cabinet. 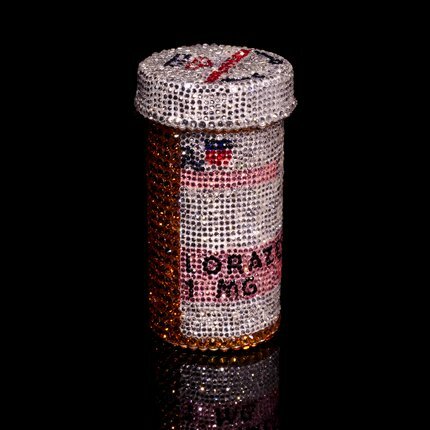 The work tackles issues of taboo around medication use and chronic medical conditions, using the visual vocabulary of jewelry to transform medical ephemera from objects often hidden away and viewed with shame into glittering showpieces meant to be seen. Because of the materials I’m using (Swarovski crystals and gold leaf, among others) having the lighted case helps me view the pieces in an appropriate context. 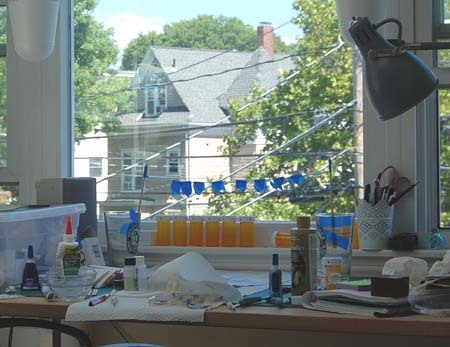 Because I tend to work with many media within a series (with my previous series From Scratch, it included all different types of food, while current materials include crystals, resin, clay, and leafing), my worktable does get a bit incoherent looking. One thing all of my work processes seem to have in common is obsessive detail (and neck pain). Right now my windowsill is lined with prescription pill bottles, I have what looks like a tiny clothesline across the back of the table with resin-dipped pills on pins hanging from it, and periodically bits of the floor sparkle with renegade rhinestones. While my workspace can look like a bit of a glitzfest, this series is actually the most personal work I’ve done. Because I’m publicly displaying my own health conditions (including chronic pain and psychiatric conditions), I’m making myself vulnerable with my art in a way I never have before. It’s both terrifying and exhilarating in a way I feel speaks to the root of what it means to me to be an artist. 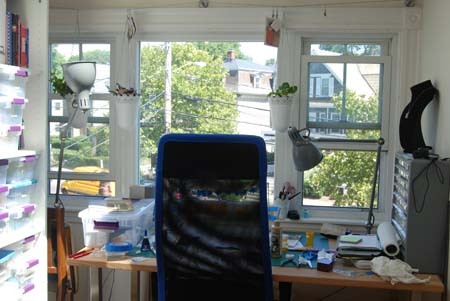 Image credits: Images of studio courtesy of Judith Klausner. 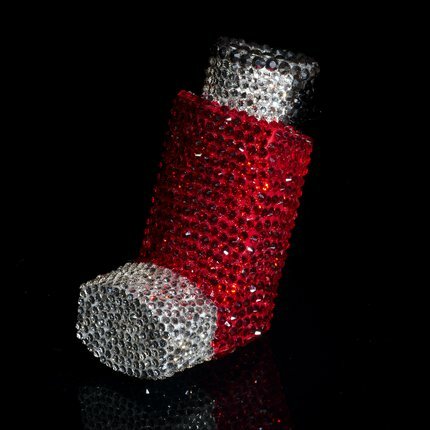 Photograph of Red Albuterol Inhaler (view 1); 2.5″×1.25″×1.75″; albuterol inhaler, Swarovski crystals; 2013, by Steve Pomeroy. 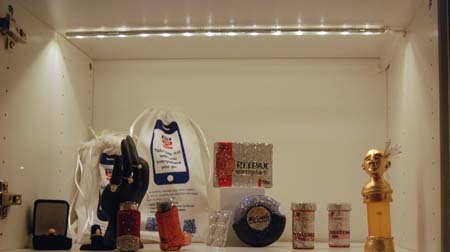 Photograph of Lorazepam (view 1); 2.75″×1.5″×1.5″; prescription pill bottle, Swarovski crystals; 2014, by Steve Pomeroy.